By digging around the back end of Facebook, I came across another hidden jewel. I couldn’t wait to share this with you! Please note that this feature is only available on the desktop version of Facebook. 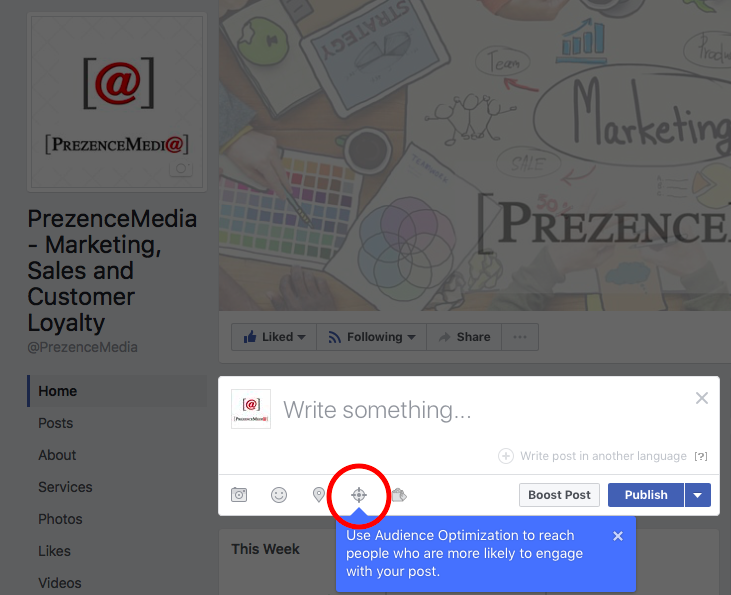 When you publish a post on your Facebook page, the audience that liked your page (your fans) can see that post. But, what if I told you that you could select who sees your post? WHOA! Say you run a hairstyling business and your target market is men, women & kids. You want to promote a new accessory for women only. When you publish the accessory post, everyone who liked your page will see it – even those that are not your targeted market. 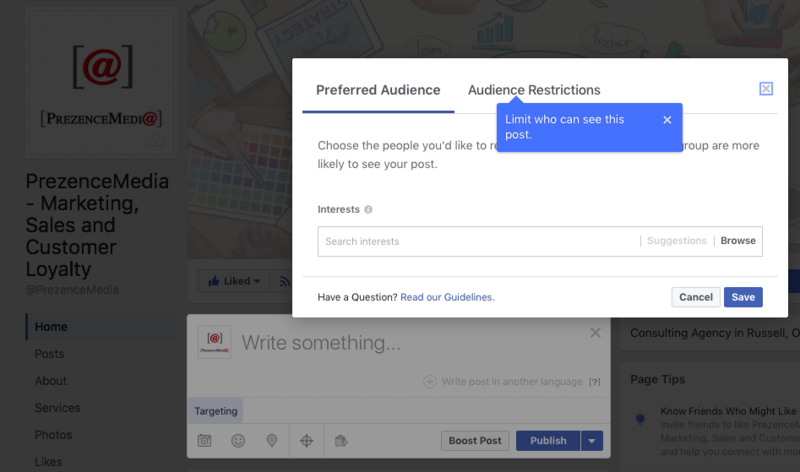 NOW, you can select who sees the post based on the market you are targeting. For this example, you could tell Facebook to show this post to women only, between the age of 18 and 60, in your area with a 10 miles radius. A – You want to keep your existing page followers. By not annoying them with posts that aren’t relevant to them – you keep them happy! B – Facebook will now monitor the relevancy of your posts to your organic following. 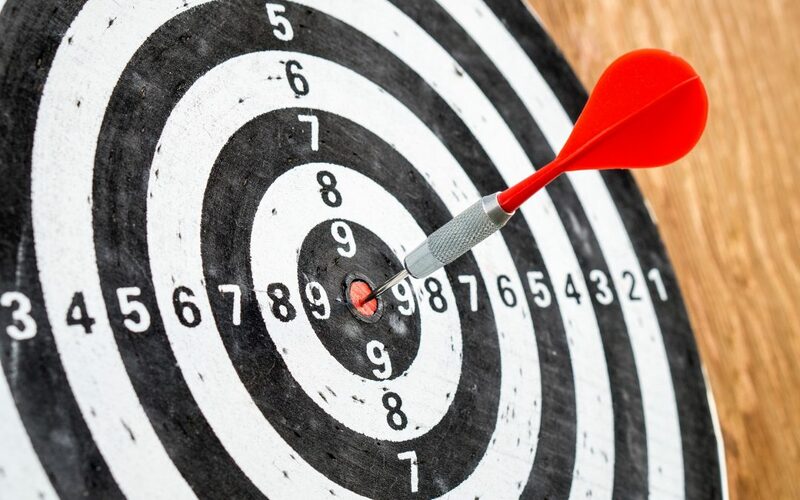 This audience targeting option will only help you in ensuring your posts are very relevant for your audience. C – Facebook might give preference to posts that are relevant to the audience, meaning they shill show more of your posts VS another. So where is this neat feature? Let’s dig it up! This feature is hidden in your settings and it won’t be accessible until you activate it. Once you get to your Settings tab, scroll down until you find “Audience Optimization for Posts“. Click on “Edit“. You will see this next screen. 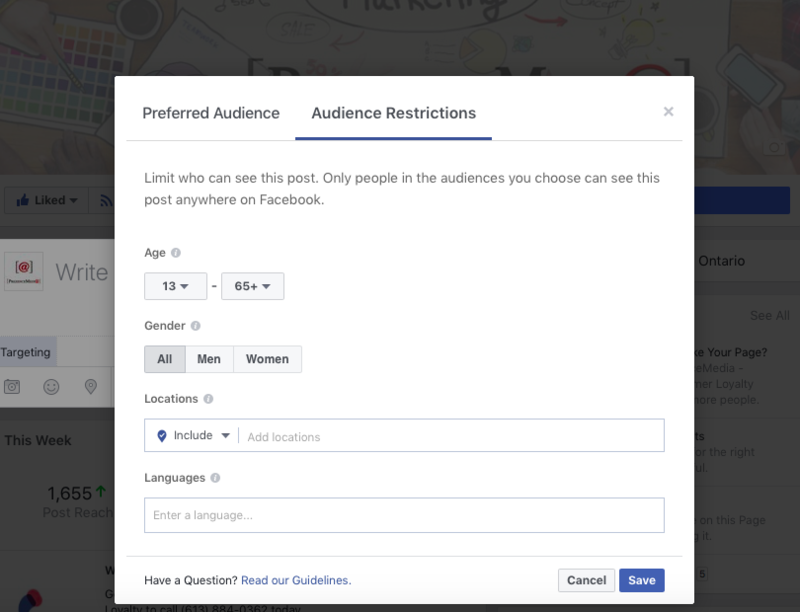 Click on the empty checkbox to “Allow preferred audience selection and the ability to restrict the audience for your posts.”. You should see this next screen. Click on “Save Changes“. Now go back to the main screen of your Facebook Page by clicking “Page” at the top-left corner. Back? Ok! Now let me show you how this works. Click on “Write something” as if you’re about to write a new posts (you might have to click twice) and then you will see the screen below. Click on the “targeting” icon (circled in image below). On this next screen, you can select your audience. You can select Interests (picture below) OR you can select Audience Restrictions (see following picture). Audience Restrictions screen below. This is where you can select age, gender, location, languages. You can also “Exclude” locations. Say you have a local deal, you can exclude your followers that are outside the eligible area. And that’s my jewel of the week! If you have questions, please don’t hesitate to reach out.